On the shore of Hulhumale, Maldives, an artificially constructed island in the capital district of Malé constructed to alleviate the primary capital island’s overpopulation. I launched my Environmental Migration Lab in 2017 at Franklin & Marshall College. The concept was to create a home for an interdisciplinary and multi-sited study of environmental migration in an age of climate change by organizing a hub for narrative and GIS data collection on environmental migration in several case study sites. The actual lab is a space equipped with microphones and GIS-enabled computers. The project will combine the concepts behind Story Maps and Story Corps: we take interviews from migrants and refugees and over the next several months, will begin to compose multimedia maps that overlay recorded migration narratives upon current climatological data. A broader purpose of this new study is to use ethnography to disentangle human stories of forced migration from the emerging militarized concept of climate change as a security threat. The current phase of the study entails recording life histories from people who have migrated to Lancaster, PA from regions of the world affected by the intersecting problems of drought, severe weather, and humanitarian crisis. Lancaster has recently been called America’s “refugee capital.” We are currently collecting data on migration and environmental change in Lancaster and sharing core research questions with an array of community institutions, which gives us an up-close perspective of how migrant-receiving communities can become new homes. 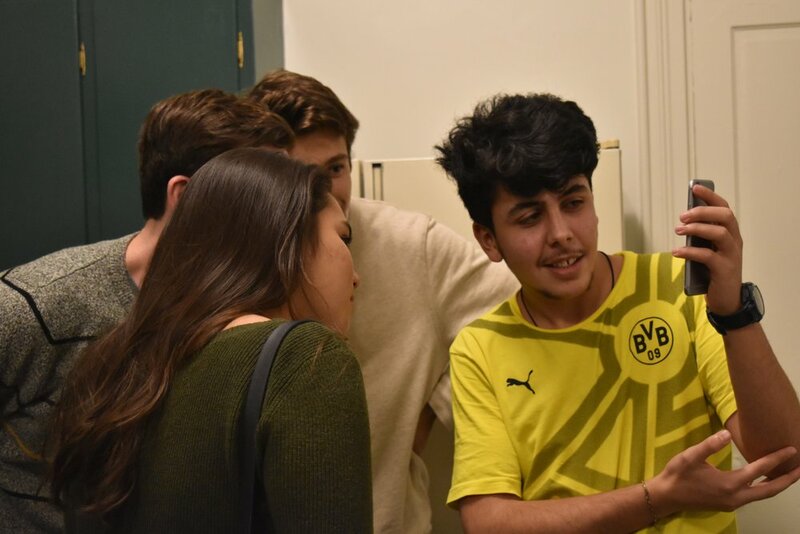 A member of a refugee family shows us a video on his phone. The Environmental Migration Lab group met this family in a Fall 2018 event hosted by Experience Bridge, which pays Lancaster-based refugees to share their stories along with cuisine from their home countries. In 2019, we will be building a new, open-access project website. That year, we will also incorporate a comparative dimension: in summer 2019, I will be initiating a second case study in the Peruvian Andes, which will allow me to return to the villages of the Colca Valley to build on my initial research into intra-regional mobility and migration. More to come, including updated information, additional images, and a brand new website! Rebar stakes jut upward from rooftops in Cabanaconde, a community in southern Peru’s Andean Colca Valley. These stakes set buildings up for the construction of anticipated levels. They give us a striking visual image of the anticipation that remittances from villagers who have moved to Peru’s cities and out of the country will soon make their way back to the village, perhaps along with the migrant family members themselves. Migrant remittances can be an important source of income in landscapes where agriculture is becoming a less reliable source of livelihood due to the impacts of climate change.